This is a complete "Ediphone" equipment. There are three units, one "recording machine", one "reproducing machine" and one "utility shaver". You often found these machines in an office, in a police-station, in a hospital etc. My Ediphones were used in the editorial office of a news paper. 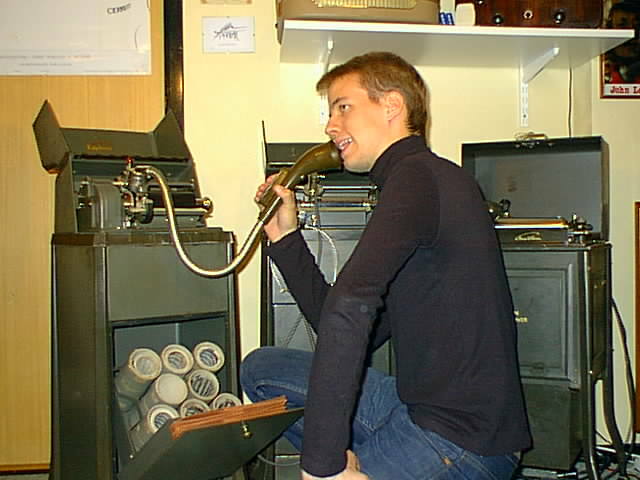 In the picture below, you'll find me using the recording machine. You switch the stick with the red knob to "talk". Then you put the horn close to your mouth, press the button on the horn and the cylinder starts to spin. When you talk into the horn, your voice will be engaved on the wax cylinder. When you have finished dictating, you switch the stick to "hear". Then you put the horn next to your ear and press the same button you use when you are recording. You will now hear what you have dictated. The reproducing machine (in the middle in the picture above) was used by a secretary. With the earphones, she (or he) could hear the dictating very clear and transcript the dictating on a typewriter. 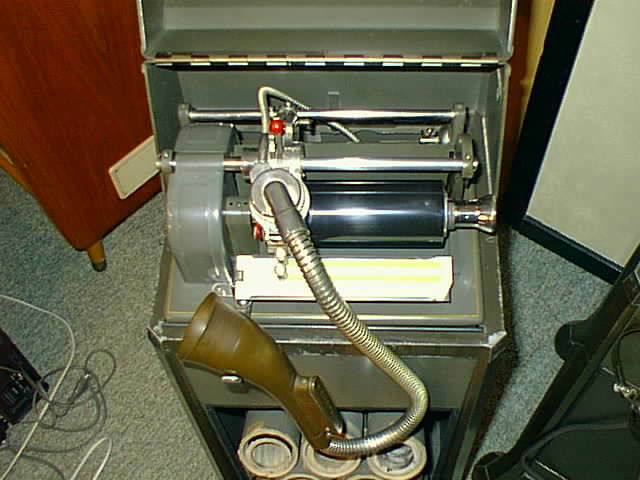 The secretary could control the reproducing unit with a "typease" unit, placed in front of the typewriter. The typease unit has two buttons, one "speak" button and one "repeat" button. With the speak button you can start or stop the cylinder and by pressing the repeat button, you can hear the latest seconds of speech again. You control the typease with your thumbs. With the utility shaver you can erase your recordings by shaving off the outermost wax layer on the cylinders.